Agreed; that applies to all of us, to some extent. > Most of these write-ups say organizations in the health industry (as well as other industries) have been targeted. ..and having assisted with reference , I have been trying to make it clear that the media focus on hospitals and health care is a misconception, and a dangerous one, at that. 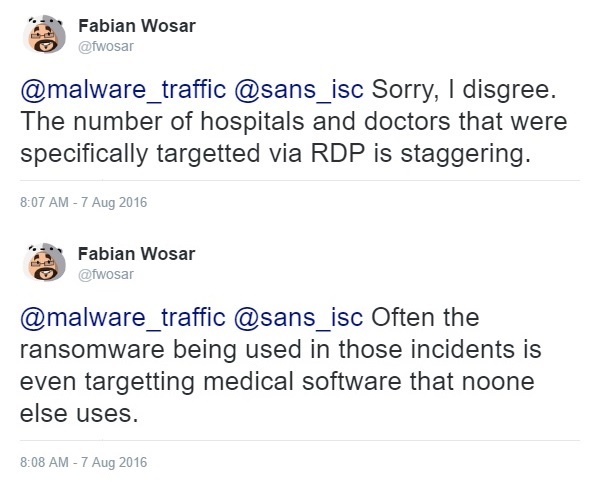 > ...media reporting leads some people to confuse large-scale ransomware campaigns with targeted attacks. Read through it carefully. Throughout the write-up, "it" is used to refer to the ransomware..."it has a more targeted approach", "It starts with a pen-testing/attack server...", "It can use other information-stealing malware...". From what I've seen, the Samas ransomware doesn't do any of this...the person or group using it does.